Gift cards have become an easy way to tell your family and friends, “I believe you merit a gift this holiday season but I would rather you just pick it out yourself.” But some cards have historically been bogged down with fees that chew away at the cards’ value until they are worth less than the plastic on which they’re printed. According to a new survey, your best bet at finding a fee-free gift card is to buy store-branded plastic. 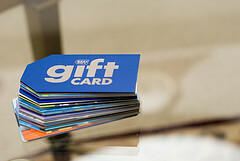 Bankrate.com has released the results of its annual Gift Card Survey and found that store-branded gift cards carry significantly fewer fees than cards from bank and credit card issuers. Bankrate looked at 55 store-branded gift cards for the survey. Only five of these cards charge a purchase fee. Meanwhile, all of the eight gift cards in the survey offered by banks and credit card companies charged a purchasing fee that ranged anywhere between $2.95 and $6.95. These are the fees assessed if the cards go unused after a certain amount of time, and which are notorious for chipping away at the face value. Bankrate found that only 2% of store-branded cards even have these fees anymore, while a whopping 75% of bank/credit card company gift cards charged either dormancy or maintenance fees of up to $3 per month once the card goes unused after 12 months. While none of the 55 store-branded cards in the survey had expiration dates, three of the eight cards from banks and credit card issuers come with expiration dates. This information is often hidden in the fine print. 51% of the store-branded cards allow users to reload money on the card. None of the eight cards from banks or credit card companies offer this ability. The one category where store-branded cards lag is in offering replacements for lost or stolen cards. All of the cards from financial institutions allow for replacement cards, while only around 60% of the store-branded cards offer this protection.